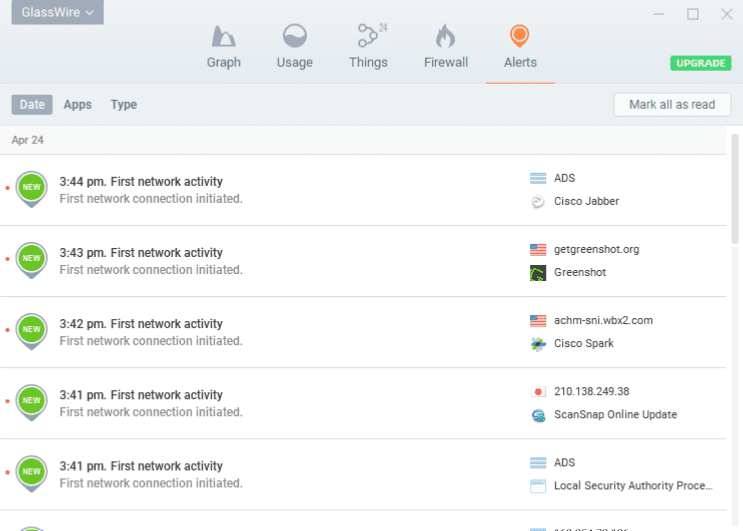 When it comes to network security monitoring, GlassWire is not only a good-looking guy but also a hardworking intelligent fellow who knows what he’s doing. It displays your network activities in real-time on an easy-to-understand graph while searching for unusual internet behaviors that could lead to malware or phishing attempts to your own privacy at the same time. It runs silently out-of-the-way in the background and only sends out alerts when anything unusual is detected. Best of all, it’s free and it runs on Windows. The installation process is very easy and straightforward, totally designed for newbies. Download the installation file from their website and you will have the program running within one minute or two. GlassWire currently only works for Windows 7 and Windows 8, including both 32-bit and 64-bit editions. 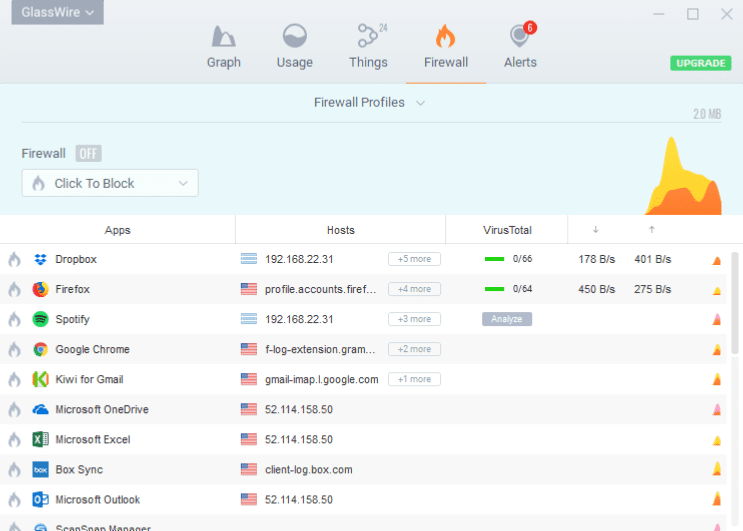 It’s really a good-looking guy, with a simplified user interface that only has 4 tabs at the top, identified as Graph, Usage, Things, Firewall, and Alerts. Very well-organized, and easy to figure out. 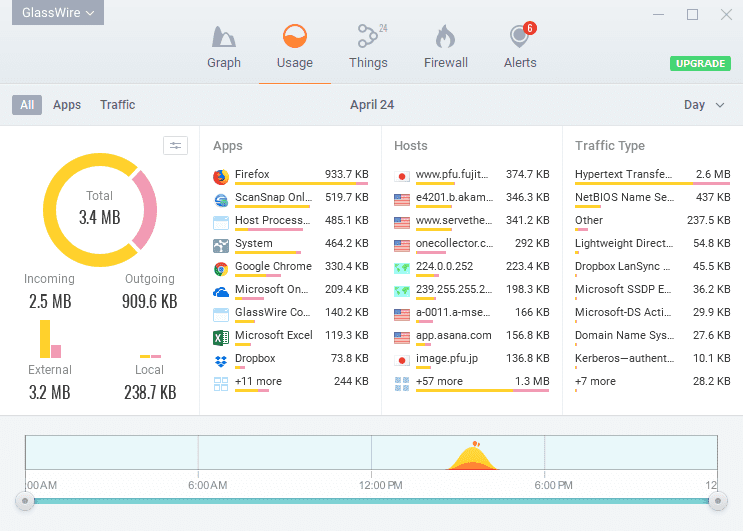 GlassWire is a very neat network tool with loads of features that provides real-time network traffic monitoring as well as internet security with built-in firewall capabilities. 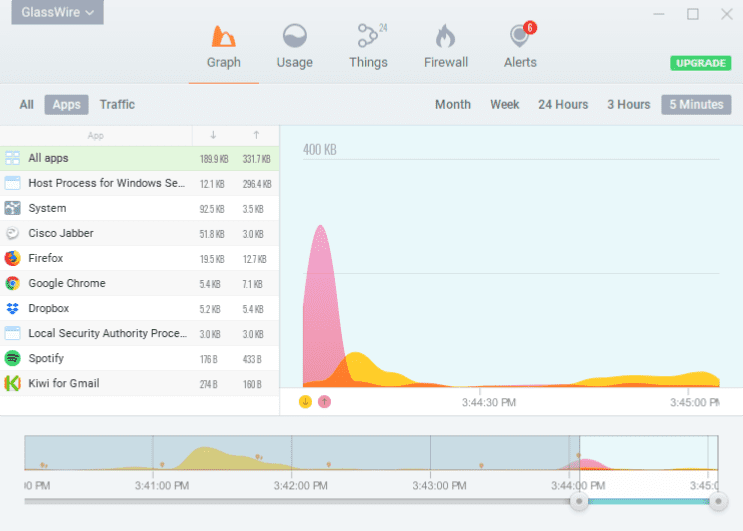 Graph tab displays the network traffic in real-time. You can switch the view between Apps and Traffic mode, or simply select to view in all mode. You can also take a screenshot at a specific time frame and save it onto your computer, acting like a Network Time Machine. Jump over to the Usage tab, that’s the place where you keep track of your daily, weekly, or monthly bandwidth usage. You can see what apps, traffic, or hosts are using the most bandwidth. If you see something suspicious, simply click the icon of the app or traffic type to get more details about this particular traffic. Alerts sent from GlassWire only appear briefly as a notification balloon popping out of the System Tray and then disappear into the background within seconds. You can also go to Alerts tab to view all past alerts in detail. 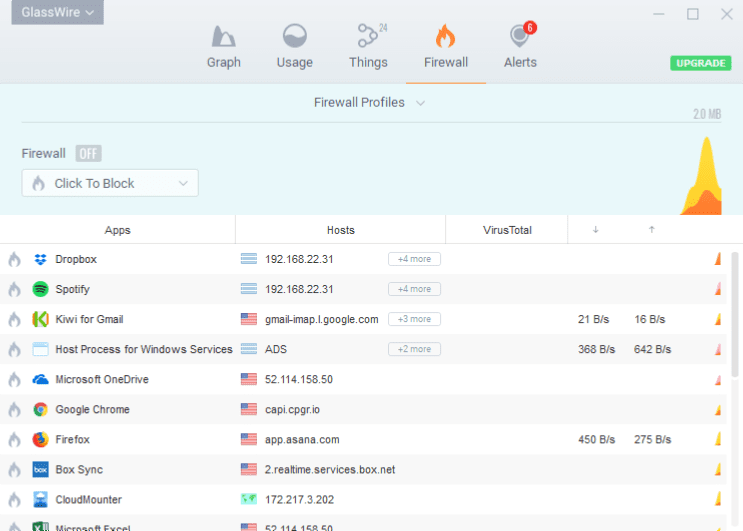 Firewall tab lists all apps that have access to the network. You can click any of the apps to block it right there or select Block All from the drop-down list to temporarily block all access. If you don’t like to see some specific types of alerts or just simply don’t want to be bothered at all, you can turn off these security alerts from the Settings menu. I am a big huge fan of VirusTotal. 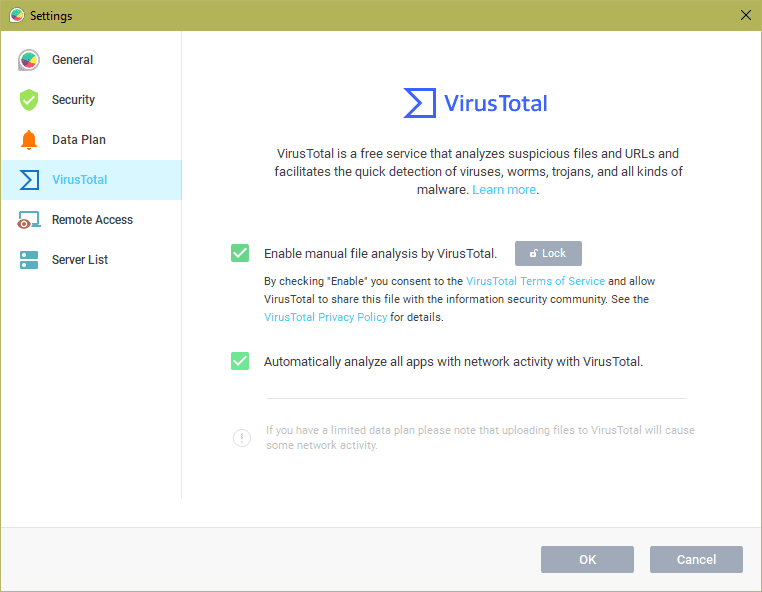 If I see any app that has the integration of VirusTotal I will be all over it. 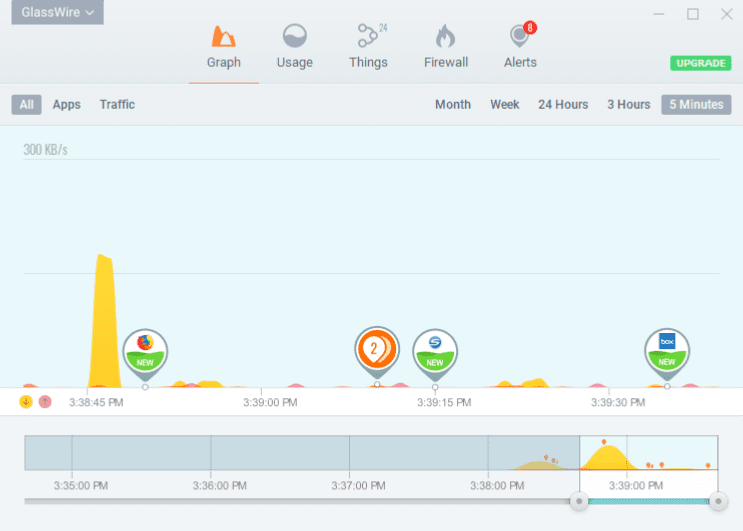 It’s pretty cool to see GlassWire 2.0 has this built right in it. To use it, you will need to go to the Settings section and unlock it in VirusTotal tab. Once unlocked, you will have the options to enable manual file analysis or analyze all apps automatically. Click OK to save the change. Now go back to Firewall tab, you will notice the VirusTotal column. An Analyze icon pops up when you hover over any of the apps listed there. Clicking on it will trigger the manual file analysis process. A green bar shows up when it’s clean. 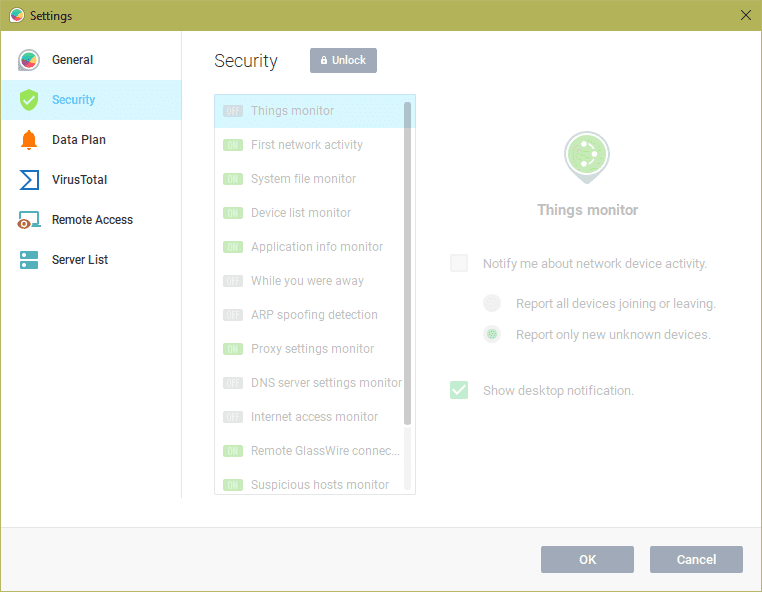 Overall, GlassWire is a very nicely crafted network monitoring tool for Windows systems with a bunch of cool features that you don’t normally see from a freeware. The additional added VirusTotal feature is going to benefit me a lot down the road.